Come see what’s happening this Easter in Huntsville, Alabama! March 21 through April 4 come to Parkway Place and Madison Square Mall for free visits with the Easter bunny. Photo packages are available. Every child who visits the bunny will also receive a free gift. On March 28 from 11am to 2pm, for free at Ingalls Harbor Pavilion you can experience coloring contest, booths, student art and more! 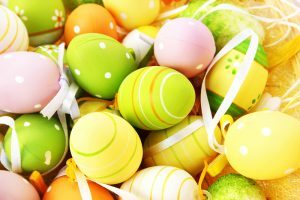 On March 28 at 9:30 or 11am for brunch with a 10:30 Easter egg hunt at Earlyworks Museum, you can come enjoy an Easter Eggstravaganza! Tickets are $12 each and can be purchased here. On Sunday, March 29th at 1pm come to Hazel Green Ball Park for an annual, free, community Easter Egg hunt! Bring your own basket! This year there’s a chance to win a brand new mountain bike! On Thursday, April 2nd at 6pm, come to Jones Valley Barnes and Noble for a free egg hunt for all ages. The eggs will be throughout the store and any purchases will go to Autism Society. At 7:30pm on April 3, come to Dublin Park in Madison for this free event. Gates open at 7:00 with the hunt starting at dusk. Bring a flashlight and something to collect your eggs. The Easter bunny will be available afterwards for photo ops. Parents are NOT ALLOWED on the fields during the hunt. This event is on April 4 at 9:30am. This event is free and is for children ages 0 to 5. Gates will open at 9:30 and the hunt will start at 10am. Bring something to hold your eggs and don’t forget to say hi to the Easter bunny! Come on Saturday, April 4 at either 10am, 11am, 1pm, 2pm or 3pm to the North Alabama Railroad Museum and visit with Peter Cottontail before your 40 minute train ride. Youngins get a free treat and the whole event is only $15.